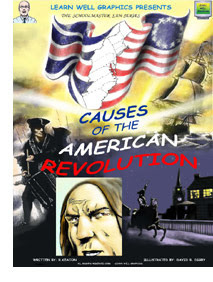 As is stated in the title, this story follows the American Revolution and the causes behind it. This CD-ROM comic with printed booklet gives a concise overview of the taxation, boycotts, and the tensions between the colonists and the British Parliament which led to the American Revolution. History can seem boring to many children, especially when a teacher focuses on names and dates as opposed to concepts and deep understanding. CAUSES OF THE AMERICAN REVOLUTION by Richard Keaton at Learn Well Graphics has come up with a wonderful way to make history more accessible and interesting. History requires discussion and explanation, yet Keaton does not overly emphasize exposition, but makes his points concisely. He stops the story, from time to time, to define a word to the reader and even offer pronunciation guides. 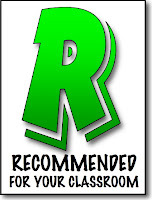 The Lesson Plan CD offers a series of exercises for the students that can be printed off. There is a wealth of information chucked into a 33 pages of comic, but it is well worth it. This is, by far, a much better choice than a typical textbook and is perfect for school, beginning in the upper elementary grades. I did find one spelling mistake. The word was spelled “whoo”; it should have been spelled “whoa”. Spelling is a serious issue for any piece of professionally produced curriculum for the classroom and it should be corrected. My criticism of this book, and it will prove true for the other book in the series, is the artwork. The illustrations are a bit juvenile for my taste. That is not to say that it is drawn in such a way as to attract young readers; rather, the illustrations are not of the high quality that I would expect to see in a mainstream comic book or other illustrated book for children or teens. The rendering of the illustrations is a significant problem. There are some differences in the rendering of the art displayed on the interactive CD and the printed comic. The printed work has some art that is pixilated (has jagged edges that look like the picture was blown up too large). That does not appear to be a problem on the CD. Also, the art in the printed booklet is sometimes much darker and harder to interpret than its CD counterpart. Despite the fact that the rendering was better on the CD than the printed booklet, that does not have any effect on the quality of the images as a whole. I think the illustrator, if he spent more time developing his talent, would be able to really increase the quality and likeability of the entire series. To the illustrator’s credit, the art was designed in color, which is a must for children. It would have been much easier and cheaper to produce this in black and white. They held out and utilized color. Unlike many comics, this entire series by Learn Well Graphics is intended and designed to be used in the classroom. Mixing technology with comic books, Keaton writes an overview of the American Revolution that could easily be incorporated into an existing class. This series is a perfect addition to a lesson or unit on the American Revolution. What makes this so exceptional and sets it apart from other comics or graphic novels, is not just the electronic rendering of the comic on CD, but the interactive nature of the CD version of the booklet. Children will respond to the movement of the panels and the voiceovers that can read all of the text, in theatrical ways. This is brilliant on the part of the creators and is essential in an inclusive classroom. Students with disabilities and those with lower reading abilities will be engaged and can read along while the narrator reads the text. Students who are gifted or those who are especially interested in history can also use the additional resources to learn more about the American Revolution. This approach makes better use of Gardner’s Multiple Intelligences when compared to traditional lecture. Periodically, when using the CD-based comic, the narration ends and a short quiz will pop up to assess the learning. A teacher can choose to stop there for the day or continue on, based on the results of the assessment. As for a technology-based classroom, there is no better way to teach history than through this medium. The information can be studied in several ways: one-on-one, small groups or as a classroom. Students can read through the booklet alone or in groups of two, or students could utilize technology and study the subject at a single computer in groups of two or more. The teacher could also choose to project the comic on the CD onto a screen and teach the entire class at one time. This opens a lot of doors for a teacher to work with a classroom that may have many students at many different levels. There are two CD’s. One contains the interactive comic, complete with moving panels and theatrical reading of text. The other CD contains information and exercises for the teacher to utilize. There is also a matrix that shows what pieces of curriculum each exercise meets. This almost deserves a HIGHLY RECOMMENDED rating as the interactive nature of the series is amazing. The only reason I did not was because of the poor quality of the art and the spelling mistake. However, that opinion should not prevent anyone from using this in the classroom. It could be an essential piece of curriculum that can energize and educate students, especially those in a technology-based classroom.